Ridgeway Pizza is the only true "takeout only" restaurant to make the cut for the Tournament, and deservedly so. They've consistently provided us with excellent pizzas before, during, and conceivably long after the Pizza Tour, proving that you don't need a dining room to serve phenomenal pizzas. 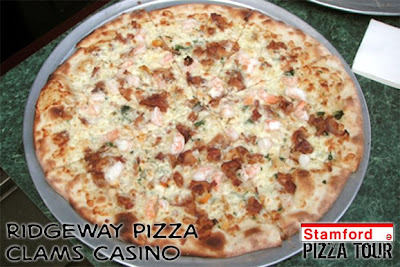 Ridgeway's entries included a specially-made Clams Casino pie with fresh clams and shrimp, crispy, delicious bacon (is there any other kind? ), and a rich Alfredo sauce, as well as a plain cheese pizza with trademark smooth, stringy cheese and incredibly well-seasoned red sauce for those less inclined to try the clams, all baked on Ridgeway's perfectly thin, crispy, charred New York-style crusts. Reaves: "Great crust, great excellent sauce, very good New York-style pizza." Allison: "Great sauce and cheese, great thin crust." Kait: "Clams Casino was delicious: good sauce, thin crust, very fresh ingredients." 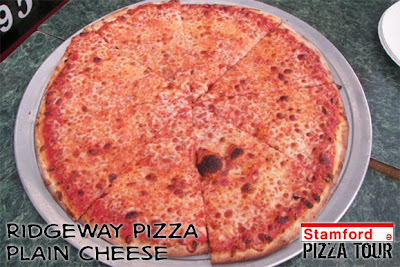 Scott: "Superb thin crust, excellent sauce (both red and Alfredo), and absolutely piping hot." Elliot: "Very crunchy, structural crust, mediocre cheese, but the best (sweet) sauce so far." 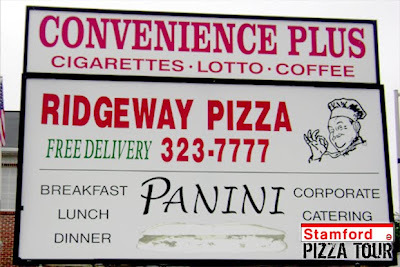 Whether for a quick lunch (2 slices and a soda for under $4), or for takeout, or for illicit deliveries to the back door of Westhill, Ridgeway has been our go-to place for years due to their quick service, personable staff, and phenomenal pizza. When we spoke to Nick, the owner, on Sunday, he told us that he trains his kitchen staff to make pizzas for his customers as if they were family. "If you wouldn't give it to your kids," he said, "throw it out, don't give it to my customers." Words to live by for any respectable business, in Stamford or otherwise. Based on the 4th place finish, I will have to try Ridgeway for the first time (despite driving by the place several times a week). Kudos on this project! 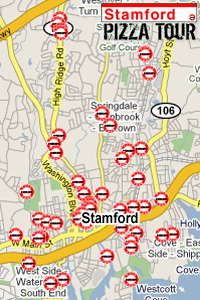 Perhaps, you can expand it to neighboring towns next round. By far the BEST PIZZA in Stamford. Friendly staff and the delivery is on point. been a customer of ridgeway pizza for 6 7 months now and it is always good.very consistent pizza.